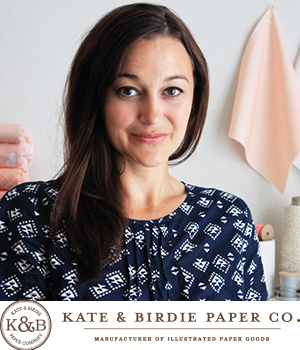 Kate & Birdie Paper Co. is a Canadian boutique stationery design house founded in 2004 by Gloria Wall and her husband Steve. With a focus on sustainable papers and simple, classic design, Kate & Birdie’s products feature Gloria’s whimsically vintage hand-drawn illustrations and patterns in a warm and sophisticated color palette that’s become a brand signature. Their paper goods – including boxed note sets, greeting cards, invitations, wrapping paper and notebooks – can be found in 1000 independent boutiques, bookstores and specialty stationery shops worldwide.